Soak the cashew nuts in some cold water overnight or for at least 8 hours. To make the base, line the base of the tin* with some non-stick baking paper. Chop up the dates or sultanas and put into a food processor along with the flaked almonds and 20g coconut oil. Process until you have a crumb mixture. To make the filling, drain the cashew nuts and pat dry with a cloth. Put them into a food processor along with the remaining coconut oil, maple syrup, lemon juice and the vanilla extract. Process until smooth. Meanwhile, liquify the blueberries, icing sugar and lime juice together to make the sauce (you can use a smoothie blender or handheld mixer). 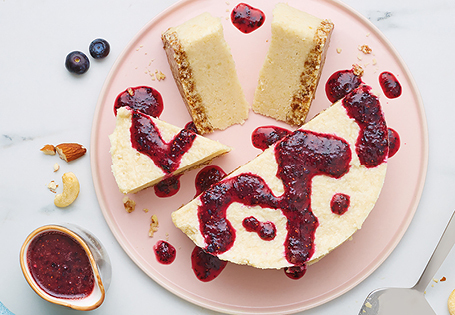 Drizzle the sauce on top of cheesecake and serve immediately. *This recipe works best with a 12-14cm springform tin.